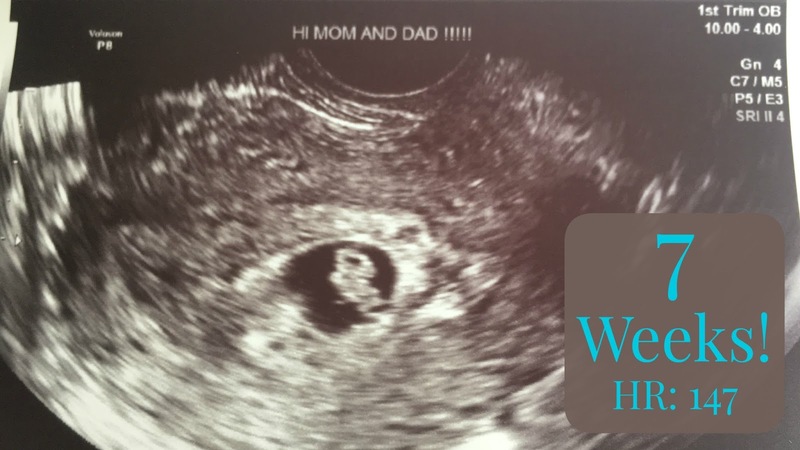 Conceivable Notions: Our TTC Journey: 7 Weeks Pregnant + First Ultrasound!! Week 7 was definitely a turning point in this pregnancy! On exactly 7 weeks, I officially "got sick" for the first time. Which on one hand is a good sign, because it shows my hormones are high.. but getting sick is no fun! Unfortunately, it happened right as we were heading out the door to our first ultrasound. But none of that mattered because... we saw the heartbeat! The ultrasound went perfectly! Baby measured 6 weeks, 6 days (so one day behind) which is just fine. The heart beat was 147-148!! For those of you interested, the CRL was 0.91cm. Baby is the size of a small raspberry! After our appointment, we were met in the hall by a bunch of the nurses who were all congratulating us. I had to hold back tears! I had one more quick blood draw for my thyroid, since it had been a while since it had been checked. The result came back the next day and it was perfect! As for symptoms, I definitely had some tummy bloating this week. The morning sickness continued, as did the food aversions. Still feeling super tired and emotional! A few days after my RE appointment, we had our first midwife appointment at the birth center! It's a free standing birth center, with a very homey vibe to it. There are a few midwives in the practice and you end up working with all of them. I was sick a couple of times that morning before my appointment and was feeling incredibly nauseous on the ride there as well as in the waiting room. The midwife was great! I had brought a bunch of test results with us (such as all the carrier screening I had done, all 30 pages of it) as well as our ultrasound photos. Since I did IVF and my due date was already established and the fact that I've been monitored so closely over the last year, there wasn't a whole lot we needed to do at this appointment. It was mainly a nice meet and greet. She did feel my uterus to make sure it was expanding properly (it was) and checked my cervix (which looked how it should). I was sent on my way with a few labs that needed to be repeated (infectious diseases, etc). I unfortunately already started to lose a few pounds due to the morning sickness. My midwife suggested I try taking the unisom + B6 combo (which is incredibly safe) to help control it. I tried it the night of the appointment and did so much better the next day!